PDMS silicone membranes that are USP Class VI and FDA compliant meet rigorous standards for purity and quality, and are used in medical and laboratory research. These ultra-thin silicone membranes provide a barrier to liquids such as blood, water, and urine while offering a permeable path for gaseous elements and compounds such as oxygen, nitrogen, hydrogen, and carbon dioxide. PDMS silicone membranes are made of polydimethylsiloxane (PDMS), an optically-clear, silicone-based polymer that is inert, non-toxic, and non-flammable. These hydrophobic membranes prevent the infiltration of polar liquids and aqueous solvents, and will not swell or deform. The polydimethylsiloxane that Interstate Specialty Products distributes and die cuts is 30 times more permeable than non-silicone stable polymers. PDMS silicone membrane materials that meet the requirements of FDA CFR 177.2600 are used in rubber articles, such as sanitary gaskets, that are designed for repeated use in biological research. The medical-grade silicone membrane material that Interstate Specialty Products sources also complies with rigorous USP Class VI testing requirements for implantation and acute systemic toxicity. Like other silicones, PDMS can use either a peroxide-based or platinum cure system. Peroxide curing is robust, but can leave unwanted compounds in the silicone rubber. That’s why Interstate Specialty Products uses a special platinum-cured silicone instead. This cost-effective silicone membrane material has stronger physical properties, lower shrinkage values, and no outgassing or unpleasant odors. Specific applications for PDMS silicone membranes include gas analysis, gas detection, gas enrichment, and gas separation. PDMS thin silicone membranes are also used with gas chromatography (GC) and for cell growth support. Additional applications include thin-film parts and medical components such as valves and gaskets. 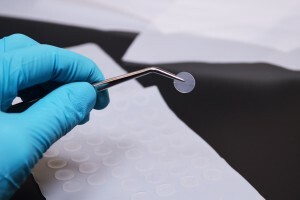 Interstate Specialty Products distributes PDMS silicone membranes in standard thicknesses from .005” to .040” as sheets or continuous rolls with a thick release liner. Our Made in the USA manufacturing company also die cuts thin silicone membranes to your precise specifications, and has cleanroom capabilities. To learn more about our custom manufacturing capabilities for die cut PDMS silicone membranes, contact us on-line or call (800) 984-1811.